I’ve been living in Northeast Ohio now for a little over five months. In the late summer and early fall, I worried a lot about what winter would be like in the snow belt, especially considering I drive a little (cute) Honda Fit. So far, I’ve only had one or two truly scary commutes to work and my car’s doing better than I expected. The constant brutal cold temps and the seemingly constant snow showers have started to wear on me, but I kinda think that about half our country is in the same boat. 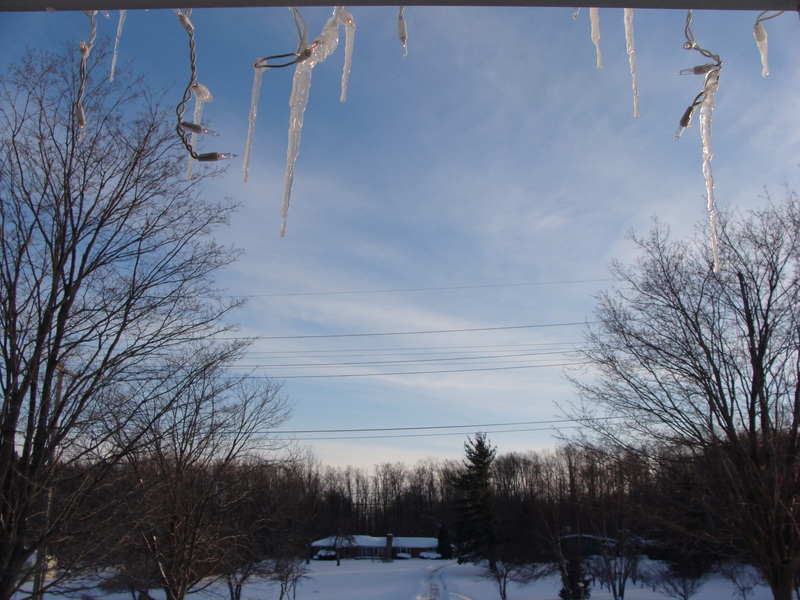 In the past, I’ve struggled to stay positive through winter. I miss the sunshine and being about to jog and hike outdoors without freezing my nose and toes. I have to say, I’ve surprised myself this winter. I do have a strong partner in Ty; I guess I’ll give him some (tons) of the credit for keeping my spirits up. As much as I loved living in Columbus, I also love living here. 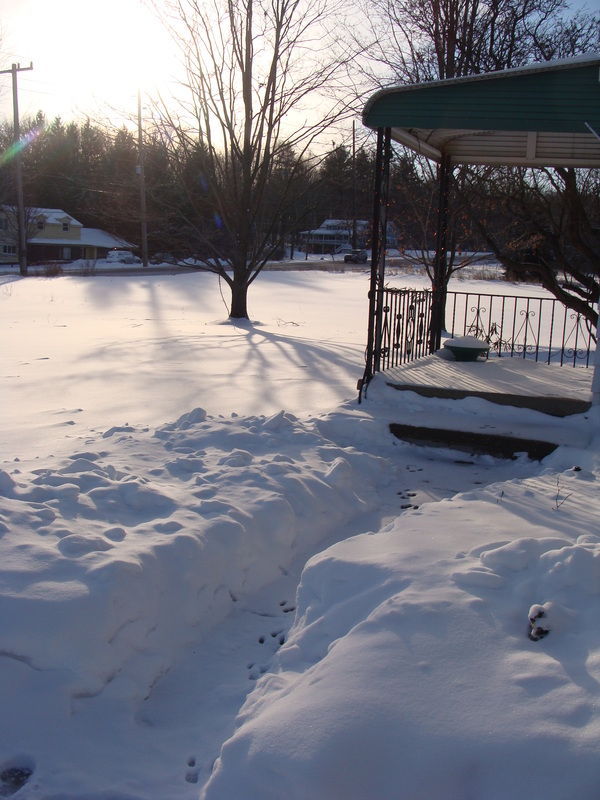 It really is a beautiful place, even snow-covered. I took these photos on the coldest day in Cleveland in 20 years. Wind chills reached -35 below. Needless to say, this is optimal time for chili cooking. 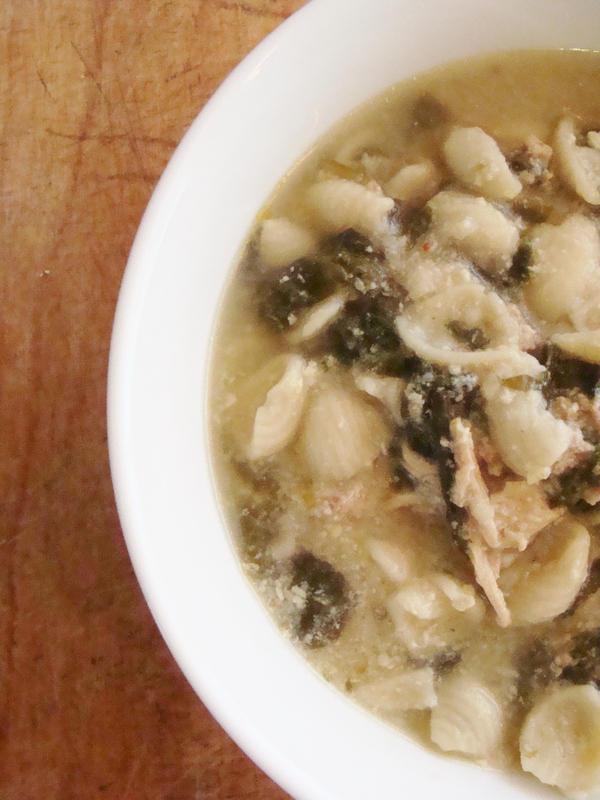 I’ve been churning through a list of different recipes to figure out which ones we like the best. 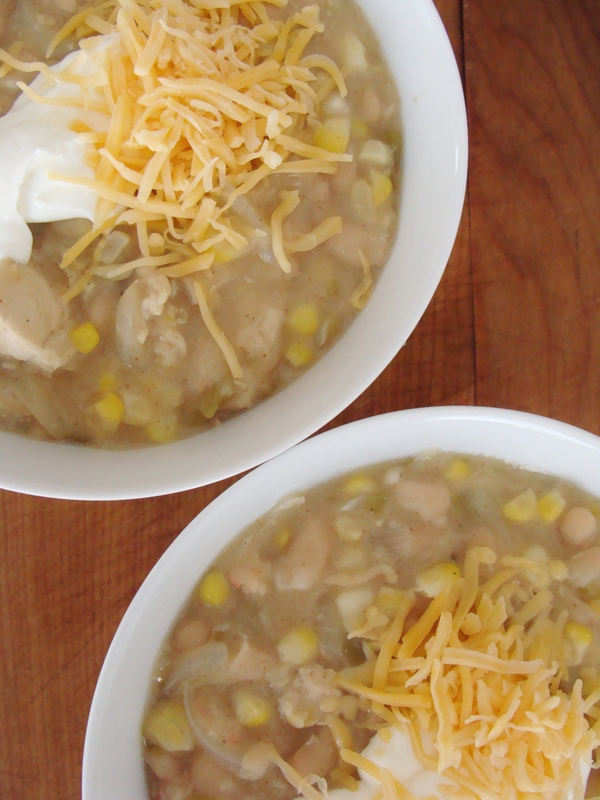 This was one of the first I made: quick white bean and chicken chili. I have a clipping of this recipe that my mom gave me from The Columbus Dispatch a few years ago. 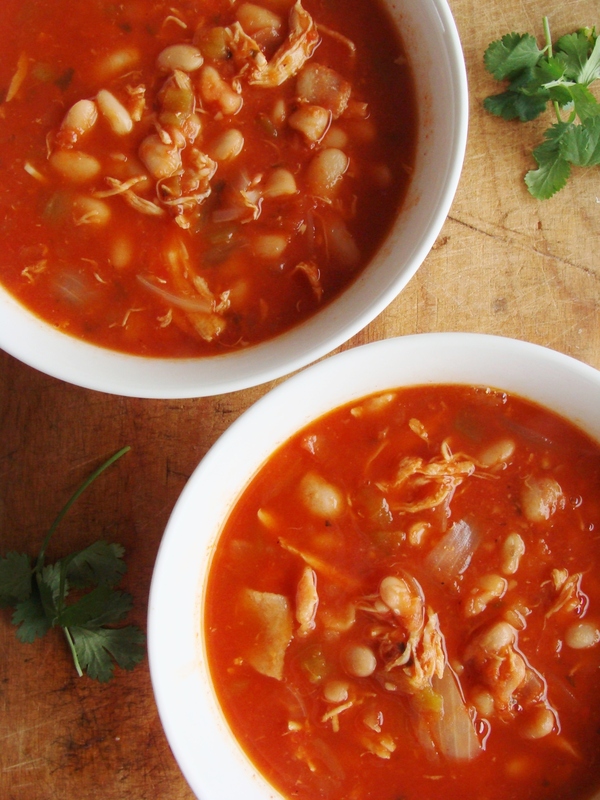 The article is titled, “Quick chili stands out as gift,” and says the chili is ready in “20 minutes flat.” I agree: This is a perfect recipe to double and serve to family and friends. It also comes together really fast. When I make this chili, I prepare all my ingredients first. Peel and chop the onion. Peel and mince the garlic. Cut the chicken into bite-sized pieces. Rinse and drain all of your beans, and drain the chiles. Ready? Heat olive oil in a Dutch oven or large nonstick soup pot. Add your chopped onion to the pot, and stir to prevent sticking. Now add the chicken and garlic. Stir occasionally and allow the chicken to cook for 4-5 minutes. 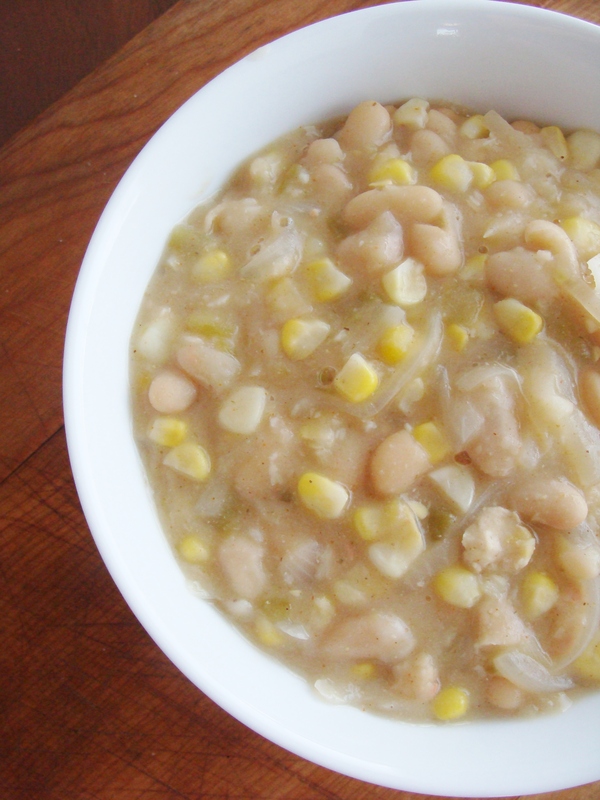 Add your corn, beans, and chilies to the pot. Then add the chicken broth, cumin, and cayenne pepper. Increase the heat to high. Cover the pot, and allow the chili to come to a boil. While the chili is cooking, mix the cornstarch and water in a small plastic container with a lid. Shake well! 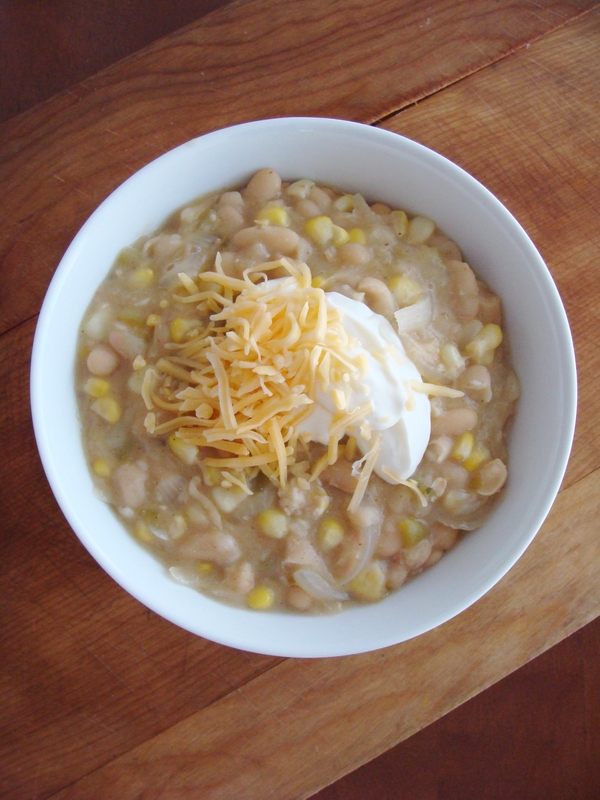 Add the cornstarch mixture to the chili a scoop at a time, stirring constantly to blend it in. Continue to let the chili boil until it reaches the thickness you prefer. 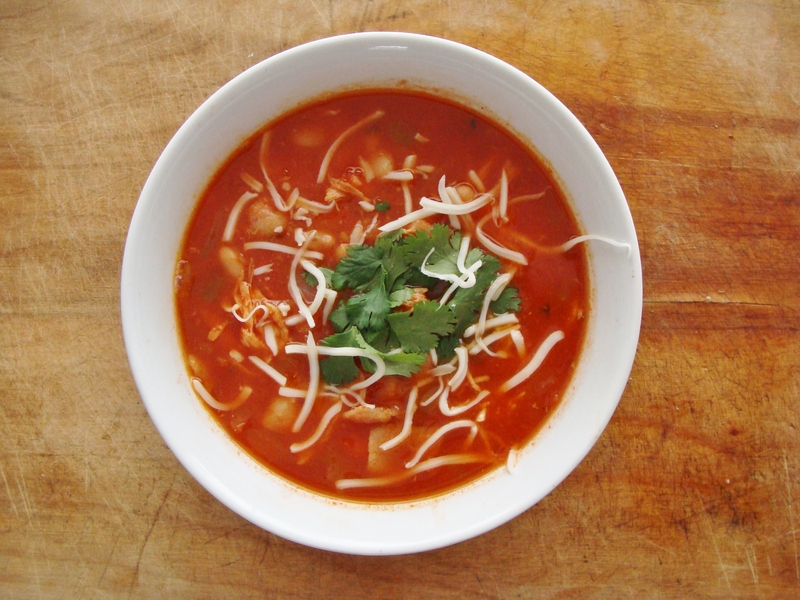 Remove the chili from heat when you’re ready to serve. 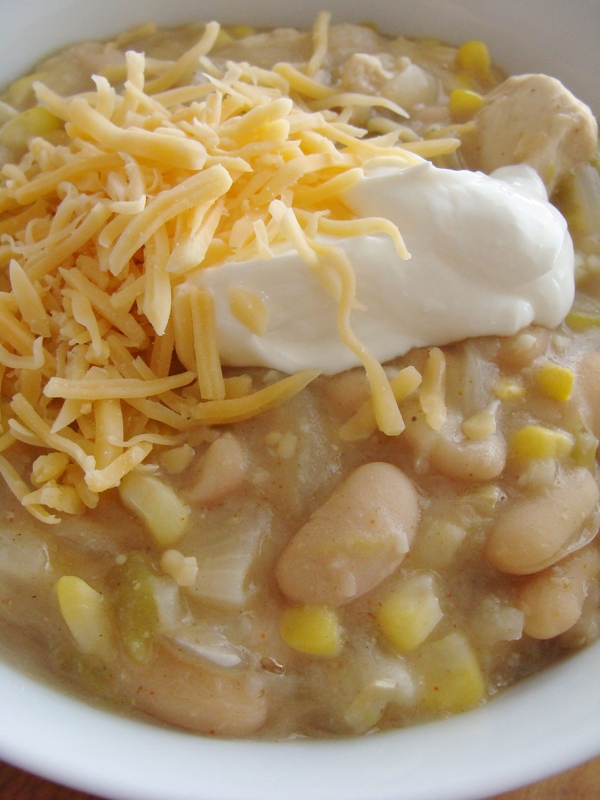 Top with a dollop of sour cream and sprinkling of cheese. 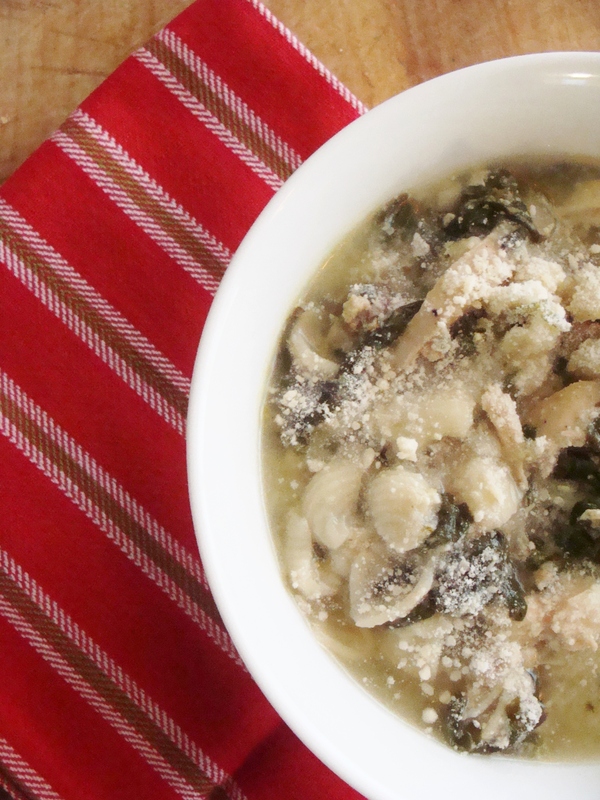 This recipe will serve 2-3 very hungry people. I would double or triple the recipe for company, particularly if you want leftovers. 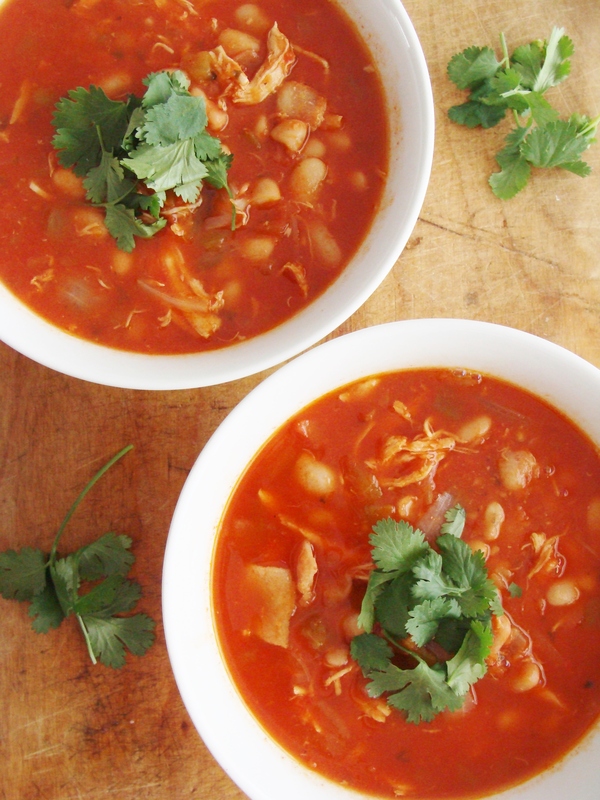 If you prefer, you could cook your chicken breasts in the oven ahead of time and shred for the soup. Other options would be to use frozen chicken strips, like Tyson makes, or a rotisserie chicken. I love stirring in the sour cream and cheese. So yummy. This buffalo chicken salad is going to become part of my regular rotation. The baked buffalo chicken breasts are simple and delicious, and if you’re not in a salad mood, you could serve them whole as a main dish with potatoes or a vegetable. But I suggest trying the salad first. Super satisfying! Preheat your oven to 425 degrees. Line a baking sheet with aluminum foil and spritz with nonstick cooking spray. Cut your chicken breasts into small pieces. Trim the fat, if you prefer. Season the chicken with salt and pepper. 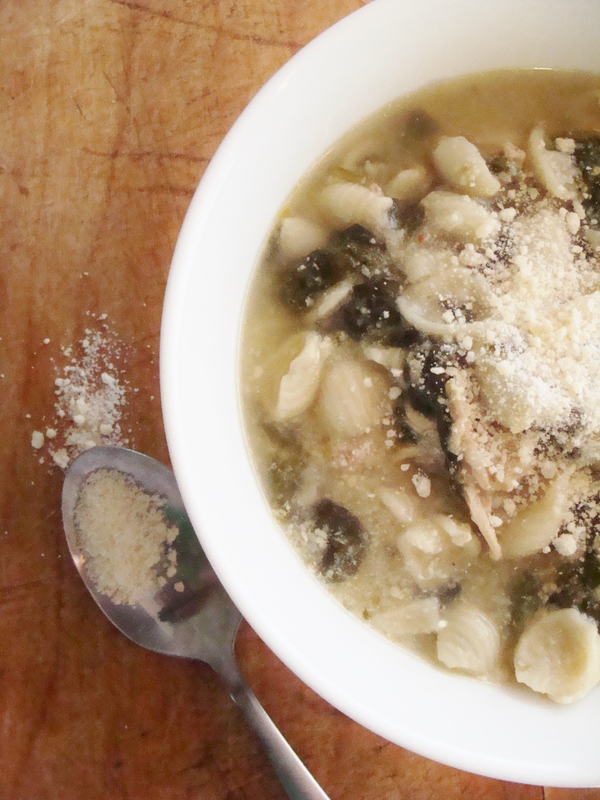 Get two bowls ready! In one bowl, whisk together the eggs and buffalo wing sauce. 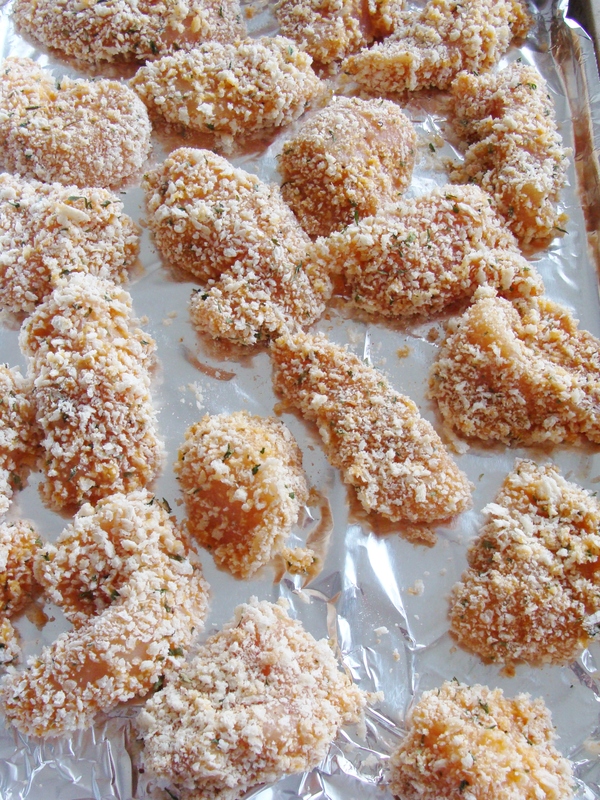 In a second bowl, mix together the panko bread crumbs, fine bread crumbs, onion powder, and flour. 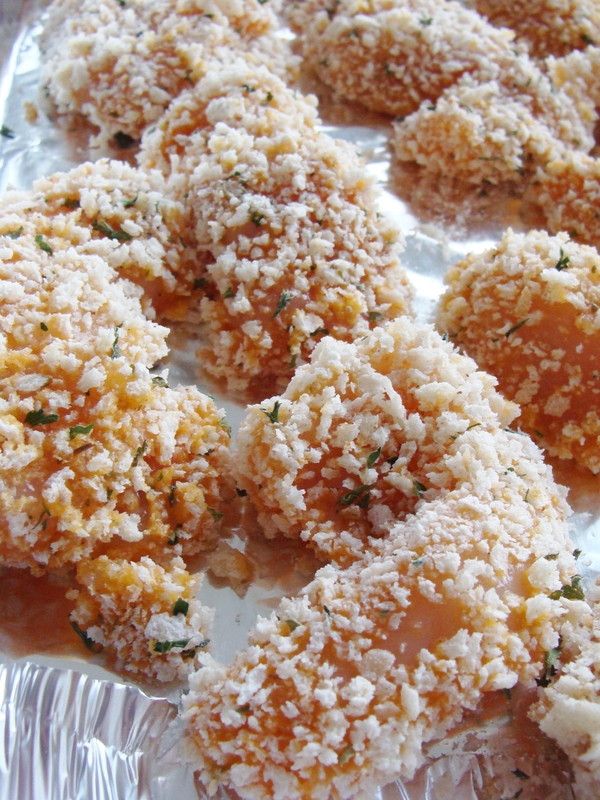 Dredge each piece of chicken first into the egg mixture, then into the breadcrumb mixture—use a fork to lightly press the crumbs against the chicken. Place the pieces of chicken on the foil-lined pan. Spritz with nonstick spray. Bake for 25 minutes. Let’s zoom in here, folks. 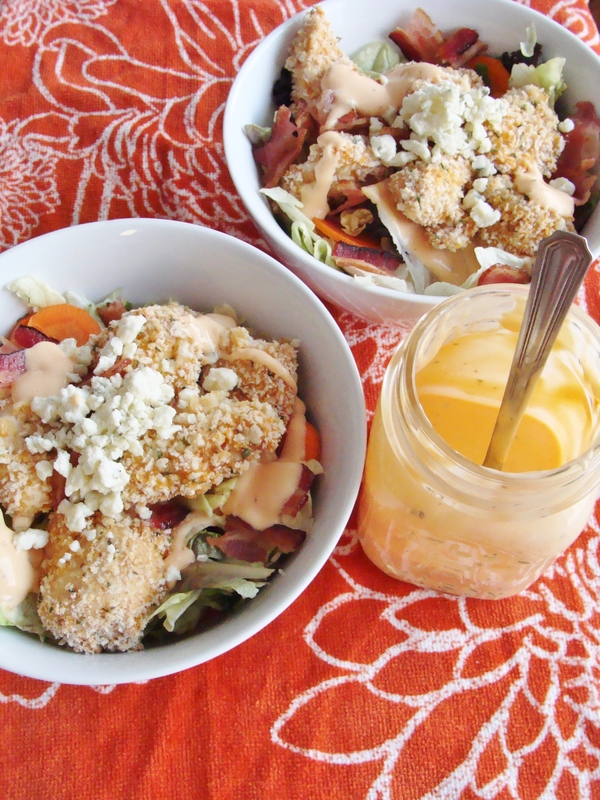 While chicken is baking, prepare your dressing! 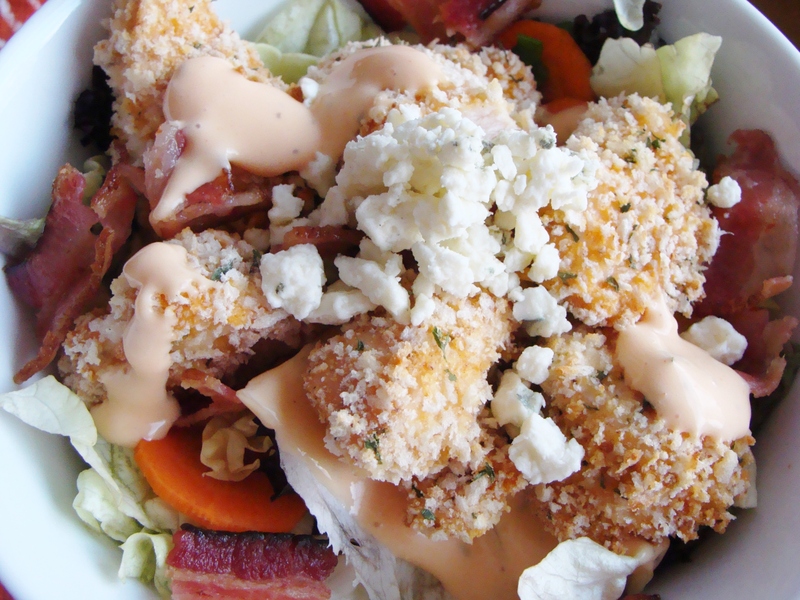 Simple: Just whisk your ranch dressing, blue cheese dressing, and buffalo wing sauce together. Once chicken is ready, you can assemble your salads. 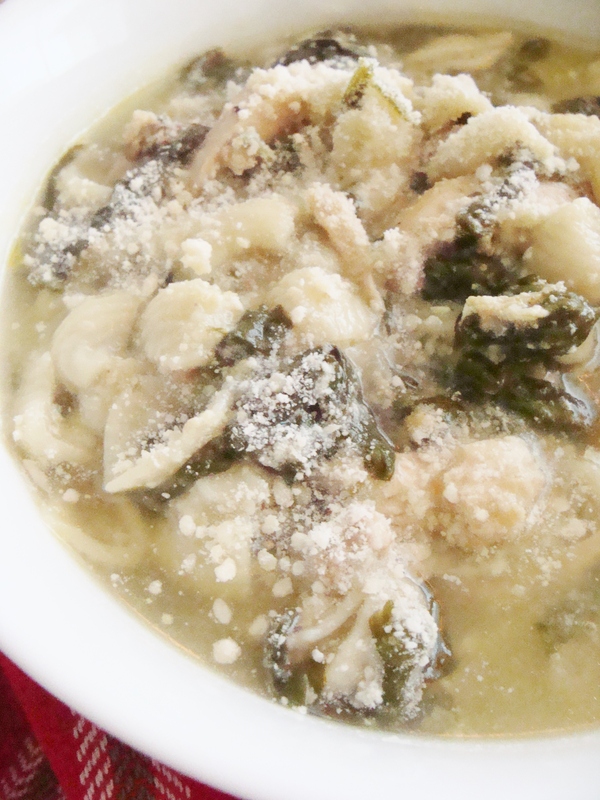 Place several handfuls of lettuce in each bowl. Add your carrots, chives, and green onions. Place 4-5 pieces of chicken on top. 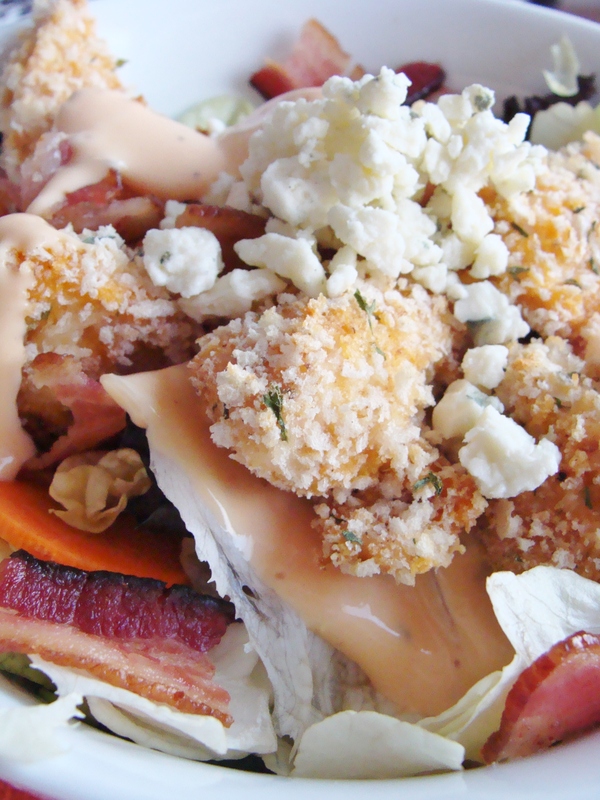 Add some crumbled Gorgonzola cheese and bacon pieces, then drizzle with dressing, to your liking. EAT UP PEOPLE! 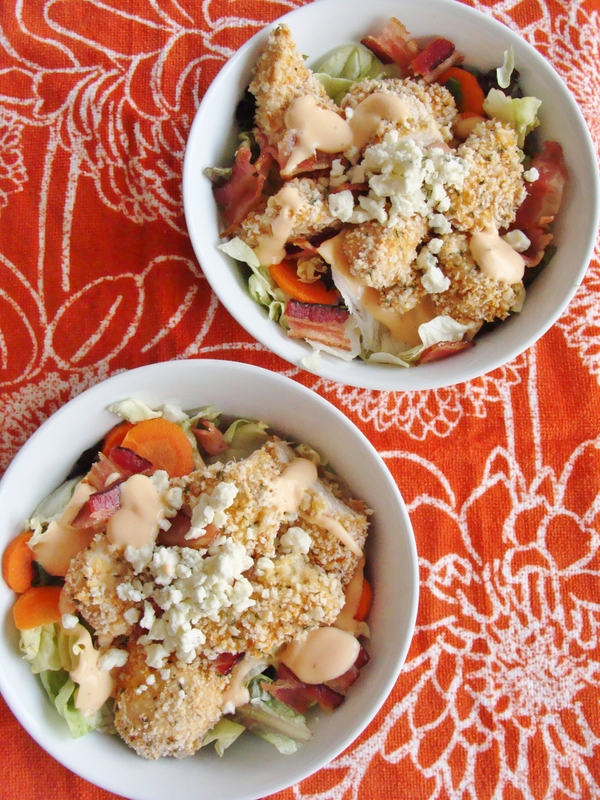 *This recipe yielded two large salads, enough to feed two very hungry people. I know we’re all getting in the spirit of turkeys and sweet potatoes and stuffing. 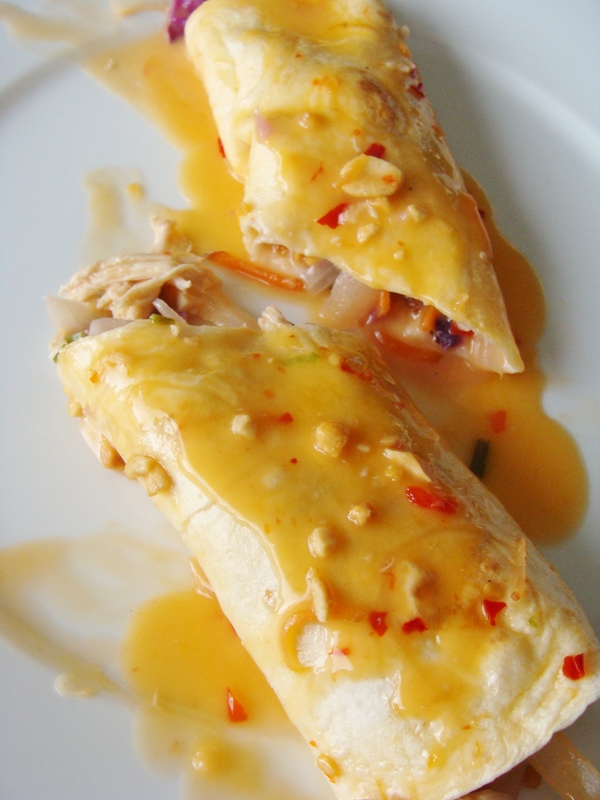 But I just have to share this recipe for thai chicken enchiladas. Oh my gosh. I will be making these again. And again. And again. 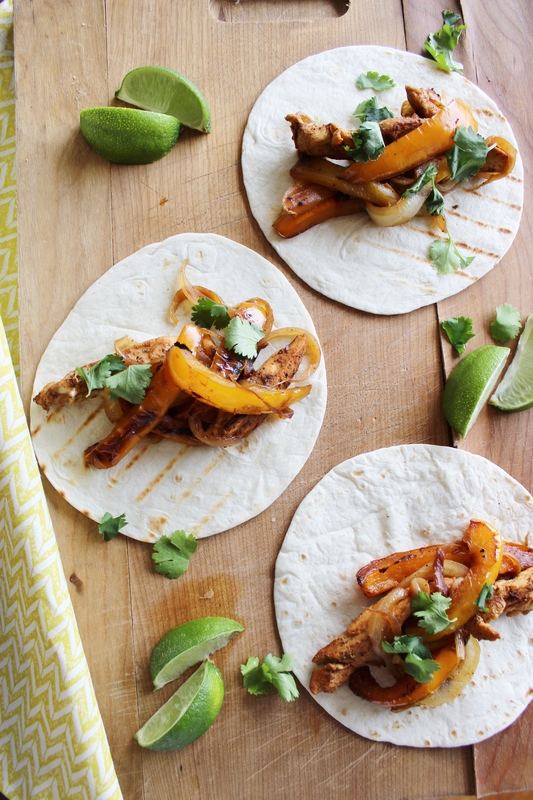 The combination of flavors just works well–and the sweet and spicy sauce? I could eat that by the spoonful. These enchiladas come together very quickly, and only require 20 minutes of baking time, perfect for a weeknight. Confession: I ate one in the middle of the afternoon, hot out of the oven. Could.not.stop.myself. *I lightly seasoned my chicken breasts with a sprinkling of sea salt and black pepper, and a drizzle of olive oil, and baked at 325 for 40 minutes. The breasts were tender and easily shredded. Preheat your oven to 350 degrees. 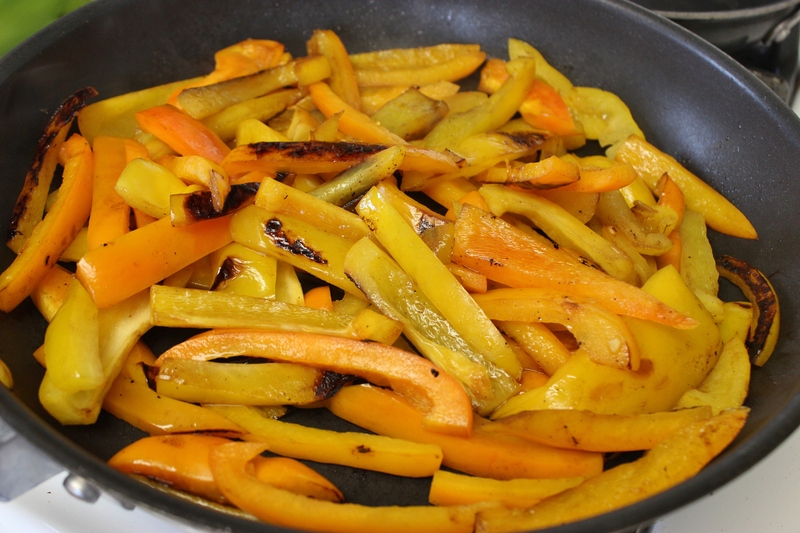 Heat a large skillet over medium heat, then add your olive oil. 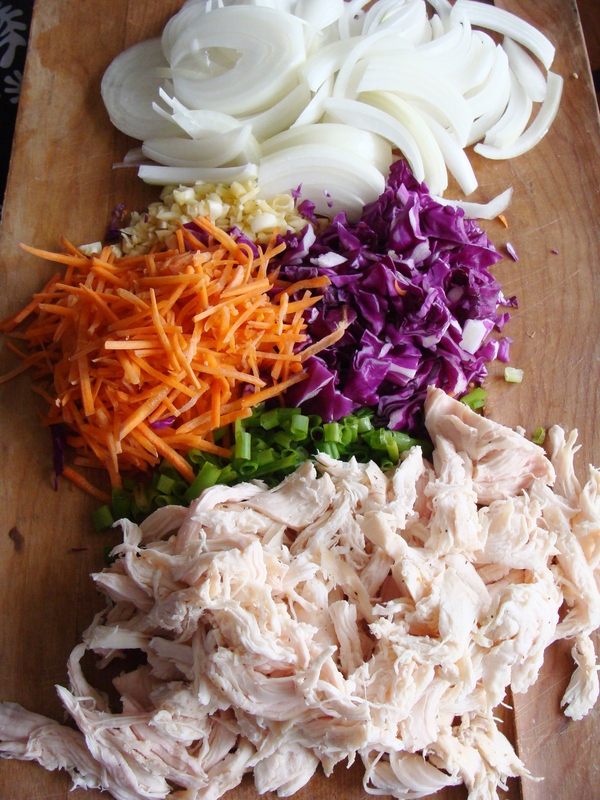 Add your thinly sliced onions, your minced garlic, and your shredded carrots and cabbage. (Pro-tip: For easy prep, get your shredded carrots and cabbage from your grocery’s salad bar.) 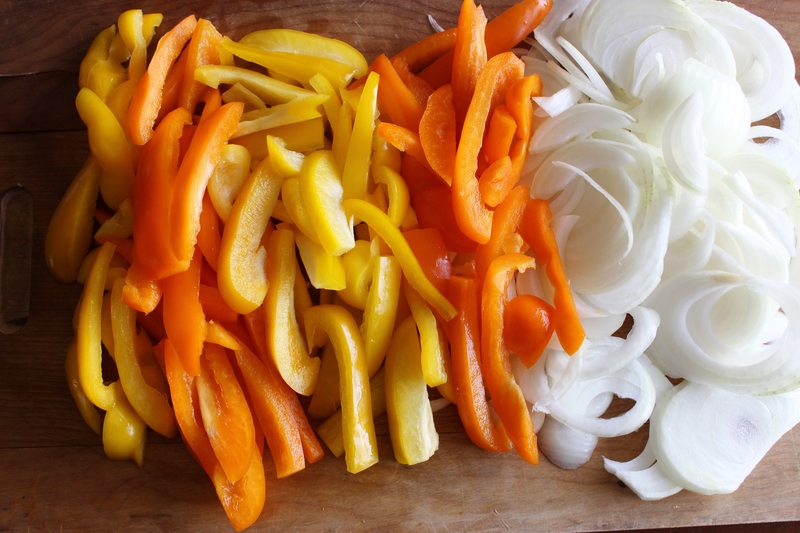 Let the vegetables cook for about 8 minutes, until you see them starting to get soft. 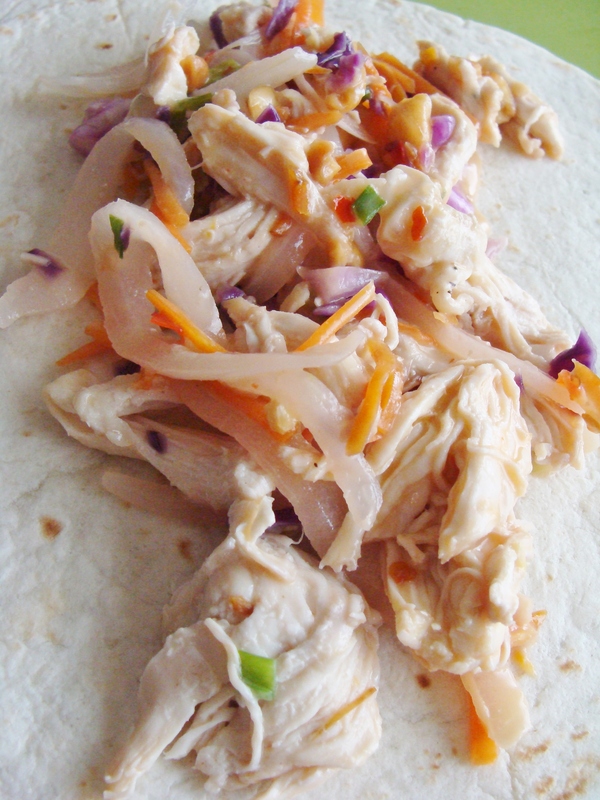 Now, add your shredded chicken, sliced green onions, crushed peanuts, and salt and pepper. Mix thoroughly. Cook for several minutes, then pour in ¾ C coconut milk and 1/3 C sweet chili sauce. Again, mix well until combined. Turn off the heat. Set out a 9 by 13 baking dish and spray with nonstick spray. 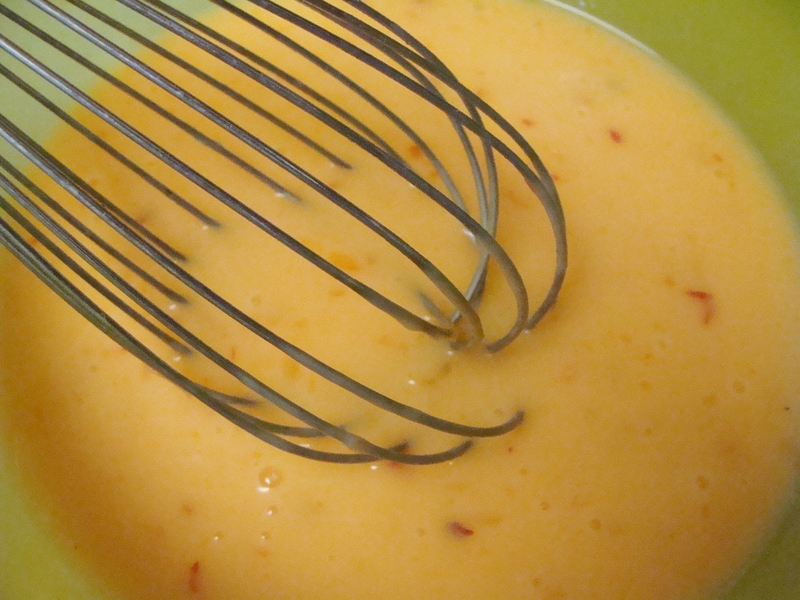 Pour the remaining coconut milk and sweet chili sauce in a bowl, and whisk until thoroughly mixed. Pour ½ C of this mixture on the bottom of the baking dish. Spread with a spatula to coat. 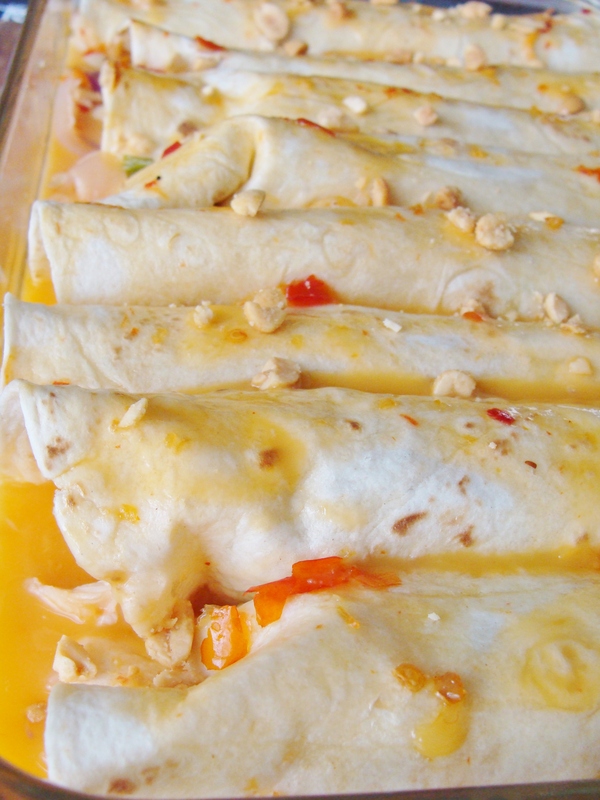 Now it is time to fill your enchiladas! 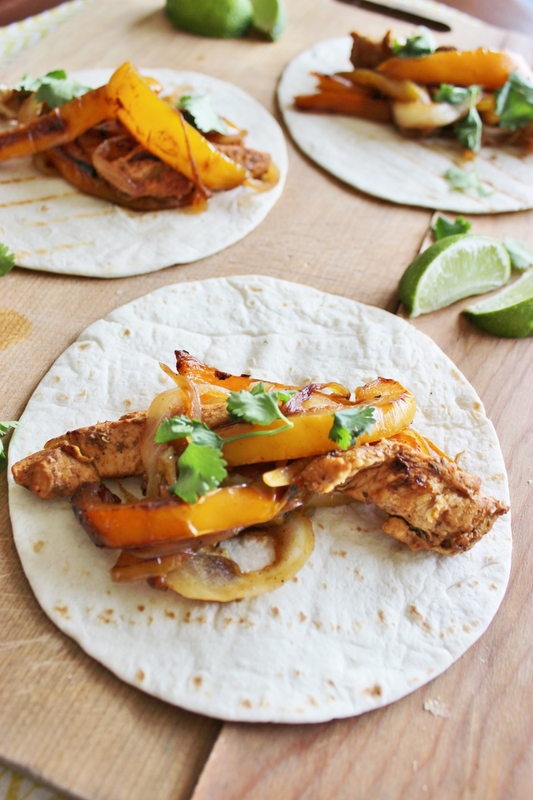 Place several generous spoonfuls of the chicken mixture in the center of each tortilla. Roll each tortilla tightly and place in the dish. I was able to fit 8 rolled tortillas. Cover with the remaining coconut milk/chili sauce mixture. 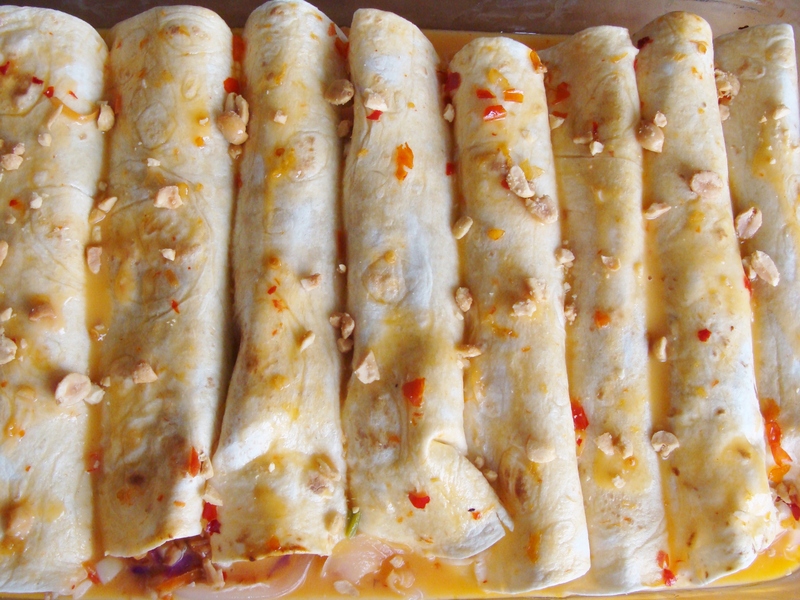 Bake the enchiladas for 20 minutes. Remove from oven and top with additional crushed peanuts. 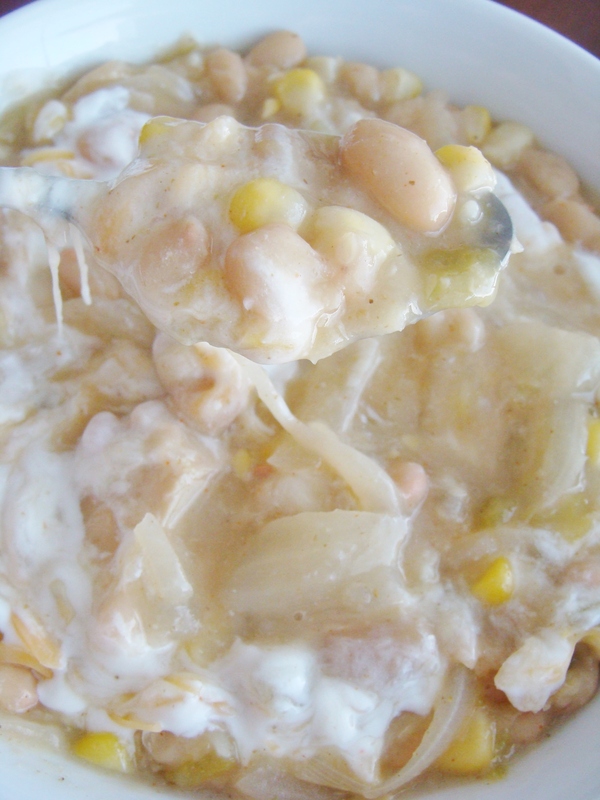 Spoon sauce from the bottom of the dish over the top of the enchiladas. This recipe (again, from How Sweet Eats) is exceptionally good. Just the right amount of spice and sweetness. 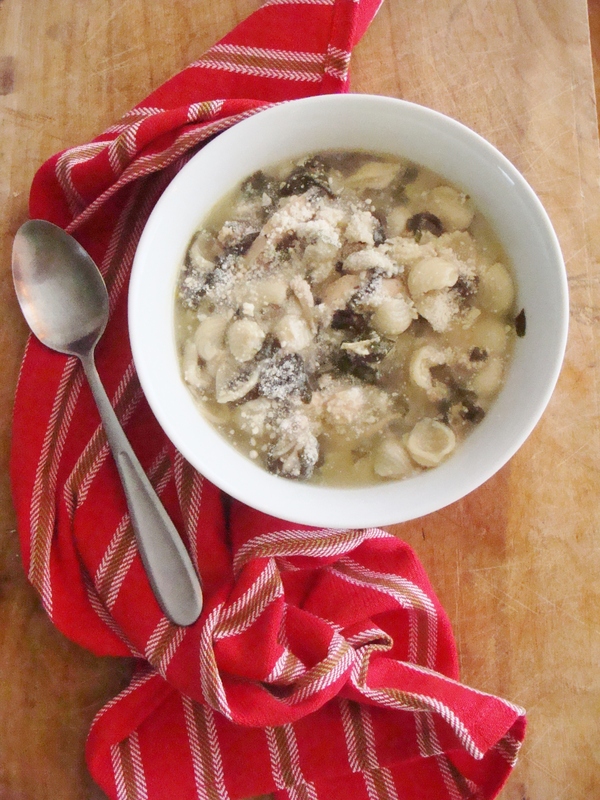 I am not a big fan of coconut, but I still love the flavor that coconut milk adds to a dish. 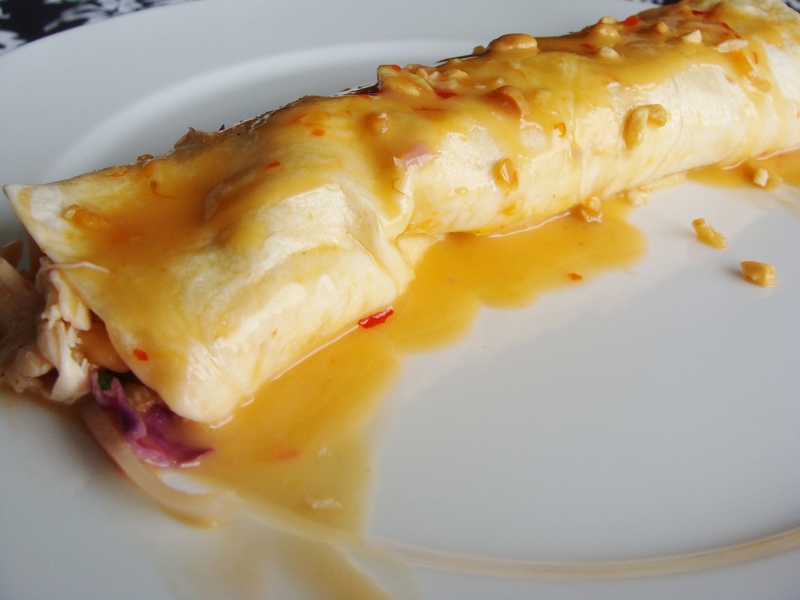 It works so well in these enchiladas. These grilled Greek chicken gyros are the ticket, let me tell you. I’d always thought of tzatziki sauce as this delicious mystery sauce too complicated to ever make at home. I was so wrong! 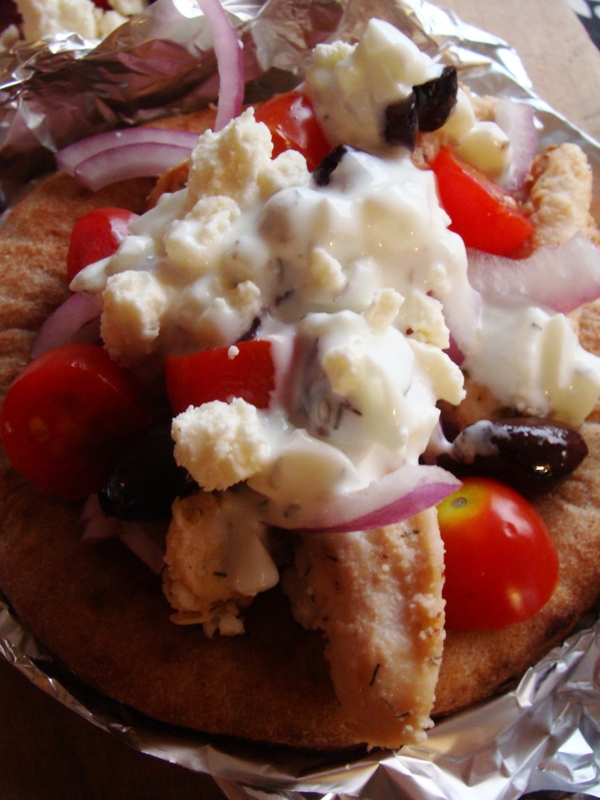 I always crave gyros, and this recipe definitely satisfied my craving. First, make your chicken marinade. In a medium bowl, whisk together the garlic, lemon juice, red wine vinegar, olive oil, Greek yogurt, oregano, dill, salt and pepper until mixed well. 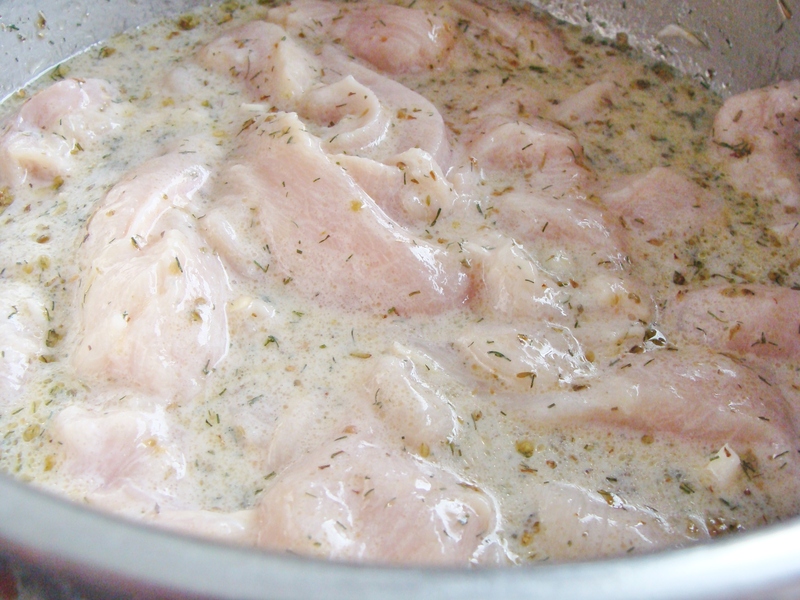 Slice your chicken breasts into thick strips and add the strips to the bowl. Make sure the pieces are thoroughly coated. Cover the bowl and refrigerate the chicken for at least one hour—could marinate overnight if time allows. Next, prepare your tzatziki sauce. Make sure that you pour off any liquid from the surface of the Greek yogurt container. I used full fat yogurt, because it is thicker. Mix the yogurt with your diced cucumber, garlic, white wine vinegar, dill, oregano, lemon juice, and salt and pepper. Add a little drizzle of olive oil. Pop the sauce in the fridge for at least 30 minutes before serving. Ready to grill your chicken? I used my grill pan. Heat a grill pan to high heat, then remove your chicken from the marinade and grill, 5-6 minutes per side. Once your chicken is ready to go, gather the rest of your ingredients for serving. I heated my pitas for 15 seconds in the microwave before serving. 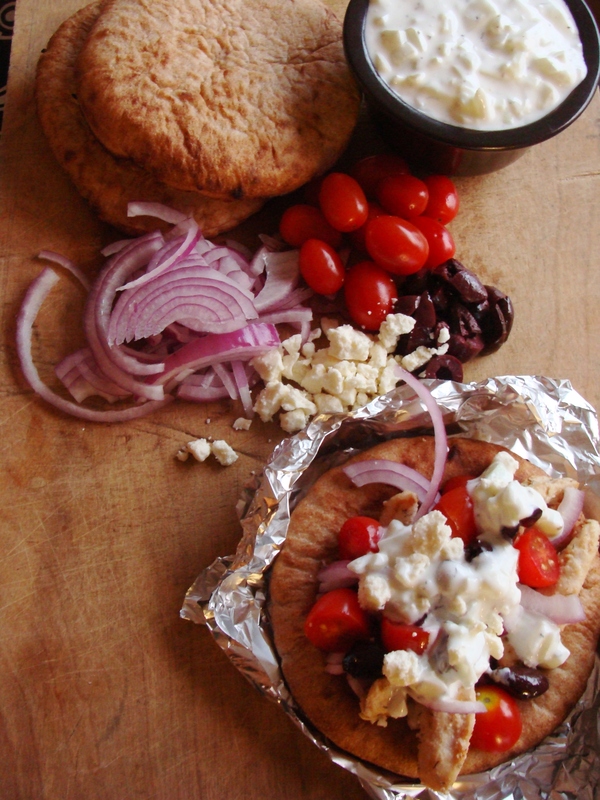 Top each pita with your chicken, cherry tomatoes, feta cheese, and chopped Kalamata olives. Add a spoonful of tzatziki sauce. 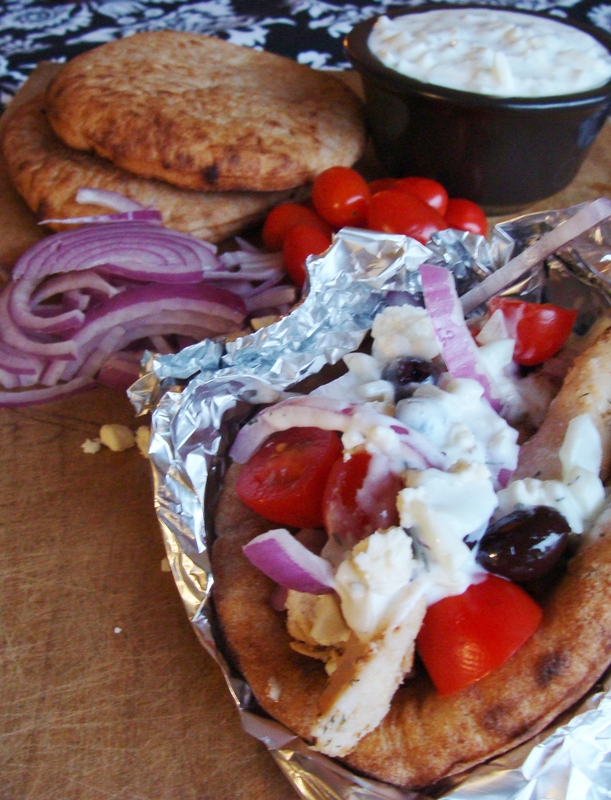 I wrapped our gyros in foil, to collect all the overflowing toppings. I may have been overzealous in my stuffing. Or maybe I just need larger pitas. Whatever, it was delicious. EAT UP! You are currently browsing the chicken. category at The Cheesy Kitchen.